Giuseppe Zanotti's sky high platform wedge in leopard print retails for $1195 at Shopbop. Love the style but can't afford to spend so much on a trendy shoe? Check out this version from Go Jane. 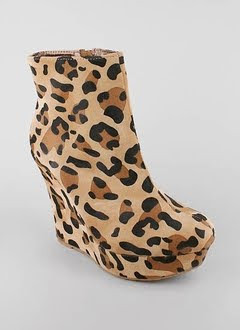 This leopard platform wedge retails for a much lower $27.00 and you can click here to purchase. *Updated - 11/7/10* - This post is originally from back in August so the Go Jane version may no longer be available. I actually saw these after The Budget Babe posted them (so credit goes to her!!) but wanted to share with my readers as well. These Bebe Charlotte booties are a great alternative to the GZ version and retail for $198. Click on the photo below if you're interested in purchasing. I did this look for less on my blog a couple of weeks ago with a Forever 21 find, this Go Jane one is much better!! Good find!! Adjua - The Go Jane booties were posted back in August so they may no longer be available. I just updated it with the Bebe version today, but it's an older post. Sorry about that! Oh okay. For a second there my little heart dance with joy. I've been wanting some cute inexpensive Leopard booties since forever. Guess I'll go back to my search, lol. Thanks anyway. Love your blog by the way!